One of the biggest hurdles an intentional community can face is figuring out how to make decisions. There are dozens of decision-making strategies to choose from, from consensus to sociocracy. But in today’s busy world, simply gathering around the table together as a community can be a challenge. At my community, meeting attendance takes a dive during the summer, as members travel, spend time with family, and enjoy the few brief months of sunshine. We often have to ask: Do we have enough people in attendance to make this decision? Can people weigh in by e-mail if they can’t be at the meeting? What if the person who came up with the proposal is absent? Consider.it is great for small communities, but works for larger projects too. Here’s an example of how it was used to collect feedback on an update to Seattle’s comprehensive plan. A similar tool called Loomio offers responses based on Occupy Wall Street’s hand gestures. 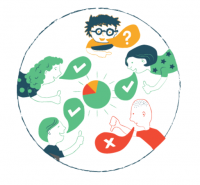 Designed by a worker-owned co-op in New Zealand, the tool lets group members quickly show whether they would approve, block, disagree, or stand aside on a particular proposal. Learn more at Loomio’s website, or check out the intro video below. Let us know if you have any experience using these tools with your community! Thanks for posting this, I feel that properly representing the people and giving them a voice is important in the co-creation process. I have not put in any time whatsoever yet on “advertising” so I dont have the shiny welcome pages that these two sites you mentioned have, but I thought I might share an app that I have been working on for the past two years that includes a “sociocracy” type function. Its called GroupUp.me. It includes the “sociocracy” functionality as well as other tools that communities need to organize including discussion sections, calendars, member profiles, and RSS news feed linking. It is also designed such that more tools can be added and shared among communities based on their needs as the platform grows. It is still a work in progress, but it is functional and very useful. We are already using it in the intentional community that I am a part of in Boulder Colorado. If you are interested in this platform, please reach out to [email protected] to get early access for you/your community.